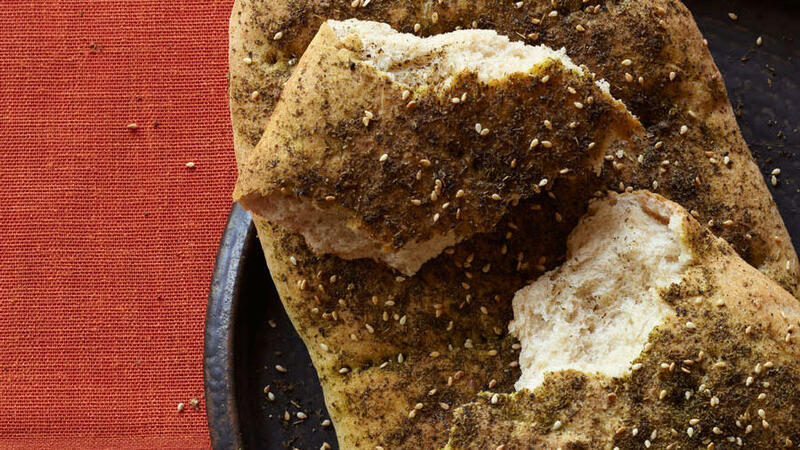 Sprinkle zaatar on top of homemade bread then bake for an exotic appetizer. When you don’t have time to bake your own bread, combine olive oil and zaatar, then use on store-bought lavash or pocket bread. 1. Sprinkle yeast into the bowl of a stand mixer and pour 1½ cups warm (110°) water on top. Let stand until yeast is softened, about 5 minutes. Add 3 tbsp. oil, the whole-wheat flour, 2¾ cups all-purpose flour, and the salt. Mix with a dough hook to blend, then beat on medium speed, gradually adding about 1/4 cup more all-purpose flour until dough is smooth, stretchy, and only slightly tacky, 10 to 12 minutes. 2. Let rise, covered, in a warm place until double, about 45 minutes. Meanwhile, preheat oven to 500° and set 2 large baking sheets in oven to heat. 3. Punch dough down, then divide in half, shape each into a smooth ball, and dust with flour. Roll out each ball onto a 12- by 14-in. sheet of baking parchment into a 12-in.-long oval. Prick dough with a fork at about 2-in. intervals. Brush dough with remaining 1½ tbsp. oil, then sprinkle with 1/4 cup zaatar. Carefully lift parchment with dough to hot baking sheets. 4. Bake until breads are golden brown, 10 to 12 minutes, switching pan positions halfway through baking. Slide breads from parchment onto cooling racks. Serve breads warm or cool, with a bowl of olive oil seasoned generously with zaatar for dunking. Make ahead: Up to 1 day, wrapped airtight; reheat covered in foil. PER 2-OZ. SERVING WITHOUT DUNK MIXTURE 176 Cal., 27% (48 Cal.) from fat; 4.5 g protein; 5.4 g fat (0.7 g sat. ); 27 g carbo (2.3 g fiber); 253 mg sodium; 0 mg chol.